The CED XL Range Bag Raincoat is the perfect way to protect your valuable range bag and contents from the harsh weather and elements. Made of strong waterproof PVC material, the Raincoat is designed with an easy access Velcro Tab and zippered compartment to insert the range bag. Two reinforced eyelets allow for the shoulder strap to be connected on the outside of the Raincoat for easy transport of the bag. 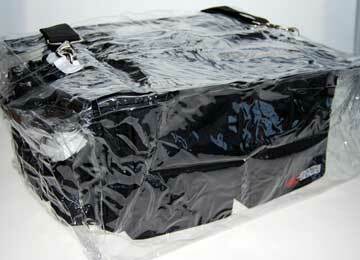 To gain access to the range bag, simply pull up on the Velcro tab and un-zipper both sides. The PVC material is easy to clean by wiping it with warm soapy water. The CED XL Range Bag Raincoat comes in a compact storage pouch with drawstring tab closure and a buckle clasp for connecting it to the range bag for easy transport. Although this product is designed to fit the XL Range bag, it can be used with the new CED Deluxe Professional Range Bag as well.